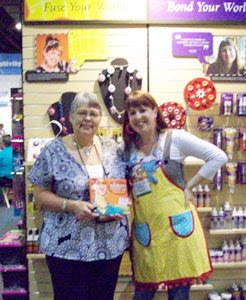 Yes, Beverly's was at the CHA show this summer, so we wanted to share our experience with you. 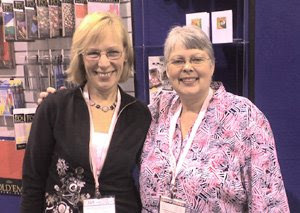 Jan, Beverly's scrapbook buyer was able to meet Diane Schultz, the owner and designer of Graphic 45. Their booth won "best in the show"! It was exciting to meet them as Beverly’s was their very first account and they were pretty excited to meet us as well. It was a thrill to talk with Suzanne McNeill at the CHA – she is the author of SO many great idea books from Design Originals. She was doing a fun demo that day using Sharpie markers on silk – then blending it with a spritzer bottle of water to make the colors flow as if they had been painted. You might recognize Suzanne also from her many appearances on craft shows like Carol Duvall on HGTV and DIY network. You can tell I was thrilled to be holding my copy of the "Naughty Secretary’s Club" a new book by Jennifer Perkins from Craft Lab on DIY Network. Jennifer is a fun personality with an awesome following from some of the Indie crafters that are hitting the scene out there – putting their own spin on crafts . She was demo’ing fun wearable brooches at the Duncan booth – made with buttons and baubles galore. 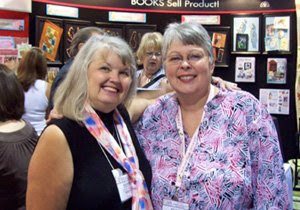 Vickie and Jennifer Perkins, author of The Naughty Secretary Club book. Karen Thomas can be called a paper wizard. She is a fabulous origami artist – she makes me think “I CAN DO IT” by her ease of instructions. She was at the show and I spoke to her about making 1, 2, 3 instruction boards for our stores for a beautiful Christmas card. Karen is also no stranger to many of the craft shows on HGTV and DIY. It was like meeting with an old friend.